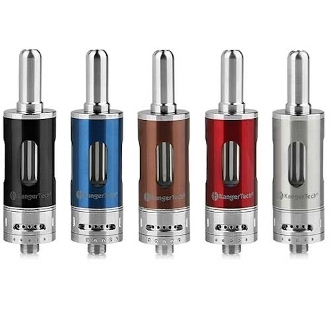 The Kanger EMOW Mega Tank is a bottom-feeding glass and stainless steel tank with replaceable dual coil head an overall fantastic clearomizer. This tank is sturdy and sleek yet substantial enough to ensure a great vaping experience. Another top notch feature of this clearomizer is the adjustable airflow control valve, located at the bottom of the tank. The airflow valve is a ring of stainless steel that covers several holes cut into the base. Turning the ring to the left or right will control how much airflow you receive with each inhale. Thicker e-liquids perform better with more airflow and thinner liquids perform better with less. The Kanger EMOW Mega tank is also rebuildable. This means that instead of tossing out the entire clearomizer, there are steps in place that allow you to remove the burned out coil head and replace it with a new one. This feature is a great money saver and will only take a moment. 1. Turn the tank upside down and unscrew the bottom base. 2. Fill the tank with less than 1.8ml e-Liquid, careful to keep the liquid from entering the center tube. Do not overfill. 3. Carefully replace the bottom and screw the tank onto the battery.